But that got me thinking about how I’ve been kinda Punxsutawney Phil with my manuscript. I’ve stayed a bit underground lately—my loyal blog followers may have noticed this—because I have been swamped with work. However, it’s mostly because I’ve been going over and over my latest manuscript. I finally finished editing it to my satisfaction two weeks ago, but now I’m trying to come up with the perfect title (no such luck yet) and writing and rewriting my query ad nauseum. Some of my friends are starting to ask why I’m *still* not jumping into the query pool. They think I’m worrying too much about it. And I suppose I am. But no matter how many times I rewrite my query, it seems like there’s something I can change—a new word I can use—something to cut. Then it’s back to the drawing board because I don’t want to put it—and myself—out there until I’m 100% on everything. Some call this crazy; others call it the “right way” of handling it. I don’t even know anymore! I suppose I’m being a little wackadoo, but I’m just afraid of opening that query door and seeing my shadow. However, I am starting to realize that, until I pop my head out, I can’t know if it will be an early spring or six more weeks of winter for my writing career. Right? Tell me: How do you know when it’s time? Sister, it’s never time. You just have to stick yourself out there, and if the bus doesn’t stop to pick you up, wait for the next one. Send some queries out, see what the queried say. Perfectionism is the icy death of a living query. You can quote me on that (and send me $5 for ice cream). Haha. OK — I did it! You’ll never be ready. Really. So your best bet is to put yourself out there. I would recommend letting others read it though. If nothing else, it’ll give you peace of mind. A little. Good luck, Ricki! 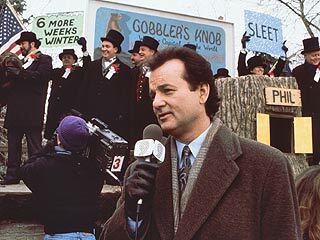 So glad you didn’t miss out on Groundhog’s Day, with it being such an important holiday and all. I have for sure. My mind is as peaceful as it can be — heh. I stuck a toe in today, so we’ll see!!!! Miss you, Carol! !